Finally: another thing to note! Here is the SWE map as of 7/1/2018. The areas in red (300-400MM of accumulated SWE as of 7/1) survived the summer and are the toe-holds for re-glaciation (as evidenced by what has happened this autumn). The threshold for summer coverage may be slightly higher further south, but I think this may be a good gauge for 2019's expansion (or not) on 2018's accumulation of anomalies. Any areas in red as of 7/1/2019 are probably likely to retain full coverage for the full year. Just something to keep in mind in seven more months...! An inventory and analysis of the glaciers and snow fields in the Torngat mountains of northern Labrador. Hereby I officially launch the Northern Hemisphere Snow Cover page on CryosphereComputing. The automated update works for the images and from tomorrow the 10day gifs should update as well. The navigation sidebar was already overflowing, so I changed it to a top bar to keep things clean. That is a very informative piece of research. Thank you. field surveys, is currently in progress." And that study tells us that we are not currently talking about a lot .. The study also ended in 2012 which was (IMO) the inflection point re: moisture feedbacks / +albedo compensating for -sea ice. They all end around that time. Another ten years of data will be very telling, assuming we are still collecting data in 2028 and things haven't gone off the deep end by then. You are correct and the study only looked at the largest 96 ice masses. The smaller ice masses, a total of 99 were ignored in this study. However, I would like to allay your concerns that further study may not occur. A more thorough study of all of the ice masses is now underway. "A full analysis of change detection over the past 60 years for all glaciers and ice masses in the Torngat Mountains, including field surveys, is currently in progress." Since you cut off the legend, I have no idea what this map is measuring...above or below the mean of what? It's snow and ice extent anomaly. And i think something like volume. Why else would it have the different colors, light and dark blue. OK. I'll hazard a guess. White areas are then areas where snow is present where it is normally present at this time. Where did you get the chart from? Attach with the legend and a link to the site and we can have a worthwhile discussion. Thank you Tealight. Awesome. I especially liked the animation. To those asking, my guess is the blue shows more snow extent than climatology, and the red means less extent. This can't show volume as the database (NOAA?) has no information on thickness. Shared Humanity, almost on top of this page, the last post from Tealight. There is a link to the site. That's correct. I wanted to include a colormap for the snow cover anomaly map, but I didn't manage to put it on the map (in the Atlantic Ocean). By default matplotlib only allows the colormap on the side which would cut a huge part of the actual map away. This would greatly distord the data compared to the normal extent map. Now i see, it's the same as with sea ice extent/area. Like 50 % of the land is covered with snow. The 10 day animation shows plenty of red further south in the US, and more dark blue further to the north. Would that not create some kind of contrast ? A warming south, and i don't know cooling, but at least a faster with snow covered north. I have changed the description to match the colorbar in descriptive words. Is it any clearer? The deepest red and blue are +-100% departure from the climatology, not the +-50% on my sea ice area. It's because the snow extent data can only be 0 or 100%, nothing in between. With a +-50% colormap it would look too extreme. The second attachment shows the actual colorbar and where it's supposed to be. 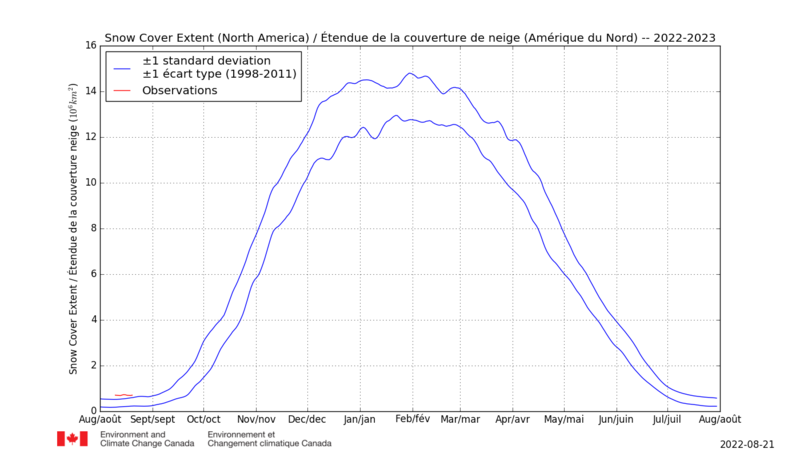 Looks like North America might be making a run for another record month. The SWE departure is even more impressive. I changed my normal snow cover map to include daily change. Now red indicates snow cover loss from the pervious day and blue indicates snow cover gain. I feel this change makes it a bit more informative than before. He bbr, do you know how they calculate that snow water equivalent ? last year there was some 400 to 500 km3 of snow water extra than average. How much snow is that, is it like 1/10 of a m3 melt water for 1 m3 of snow. Or is it like 50 % ........? I have no idea. I consider 1KM^3 of SWE to be the same equivalent to 1KM^3 of sea ice but I could be wrong. They are talking about snow water. That's after the snow melted i would think . For normal snow it's like 10%, old snow 50 %, ice 100 %. So how much snow was there extra, 500 km3 represents a layer of 5 million km2 a meter thick at 10 %. Snow water equivalent (SWE) is the depth of water that would result if the snow mass melted completely. From the perspective of water resources, flood prediction, and engineering, the most important observation (and one not taken by most weather observers) is the "Snow Water Equivalent of Total Snow Depth". This measurement is very important as it represents the amount of water contained in the total snowpack that is available to melt and run off when temperatures rise. Thus it can be used to forecast future water supplies and assess the potential for flooding. It can also be converted to weight per area. This number is critical for monitoring the weight of snow on roofs. For example, if there are 10 inches of old packed snow on the ground, this may contain 3.0" of water content which equates to nearly 15 pounds per square foot if uniformly distributed on the ground and roofs. This is very frightening. I would imagine we will see a very severe outcome as this heat comes up against the snowfall about to fall across the Northeast (several events over next ten days per 00z EURO). This is D10 water temp vs. same time 2017. The Gulf Stream bulge got worse tonight. I would say it may be unprecedented for time of year. ^map is wrong -- the EURO apparently has a bias where it creates a crazed Gulf Stream each and every run. Also: first snow of the season now falling in NYC with a few inches expected! Very, very early. 6.4" at Central Park, largest early season snowstorm on record...! It was ridiculous today. Looks like North America is once again pushing 50%+ vs normal SWE. I think things are a-changing in North of 49 Ameriky. SCE and SWE halted their remorseless rise in the last three days or so. Somewhat warmer weather moving across West to East by the weekend.. Still very cold in the far north of Central Canada and cold, but less cold, elsewhere. Signs of less extreme snowfall. Maybe a continuing slow down in Baffin Sea freezeup, and later a freeze slow down in the southern half of Hudson Bay. North America Snow Cover Extent stalled and now just within 1SD above average. Snow Water Equivalent continues to rise. Looks like some lessening in extreme cold in central and eastern Canada until the end of the month, but then extreme cold may return. Yep, looks like the tropospheric PV (?) has moved to Europe. We will probably see "normal" gains for a week or two before it returns and rapid gains resume. Snow Cover Extent (SCE) continues to decline. Snow Water Equivalent (SWE) continues to increase but slower. There will be snow (but not a lot?) for the rest of November apart from the Canadian Rockies. I also attach a precipitation map from GFS for Monday, just because that storm about to hit the Canadian Rockies is really impressive. That storm moving out of the Rockies is looking rather impressive. I suspect it will increase both values in the coming days. A small preview to show that albedo doesn't matter in winter. Currently Greenland absorbs the same amount of energy as the Northern Atlantic (none). Without a coastmask there is just a big empty void on the map. I calculated how long in each year (2000-2017) a gridcell is covered by snow or ice. The presentation is quite bad with google sites so I recommend viewing the images in the google drive folder or even better download the netcdf file and choose the visualization yourself. I calculated how long in each year (2000-2017) a gridcell is covered by snow or ice. Wonderful images. Kudos to you Tealight. Do you have a calculation of the average over the 2000-2017 period? And if so, can you make images that show departure from the average? Then we can all reach consistent conclusions about the durability of snow in a particular year. Nice. Animation of 2000-2018(until nov24). nice idea. does this look good? Well 2018 hasn't finished yet so the scale has to finish early too. I also think the actual average map is of interest, as it can show which specific points and areas tend to be more or less snow-covered. Love this map! New England is probably a good match for Quebec re: totals ranging *up* to 750%+ of normal for the period. Ok here is a map of the 2000-2017 mean snow coverage. Do you like the colorbar better with inconsistent ticks of 90 days & last one of 95 instead of the three 100 day ticks? Thanks Tealight. I like everything about this map. The color bar ia fine with the 90/95 ticks. I do note that the very northern tip of Quebec (the mountains?) is prone to very long snow coverage. That's where the "signs of impending glaciation" were claimed earlier this year. Time for the Farmers' Almanacs, otherwise known as Environment Canada and the US Climate Prediction Center. Temps Dec to Feb above average just about everywhere, except towards the South and East. Really warm Alaska. May be dryer than normal around the Great Lakes and wetter in Alaska, elsewhere average or below. Temps above average from Pacific Coast north to the Beaufort and eastern CAA. Colder for Hudson Bay and N.E. areas. Elsewhere average. Rain/snow pretty much average all over. Me, I am off to consult The Runes. Having peered into the future with low confidence, here with high confidence is some snow data from https://ccin.ca/ccw/snow/current as at 1st December. Snow extent in Eurasia is at average while snow mass continues to be at about 1 sd above average. (no images attached). 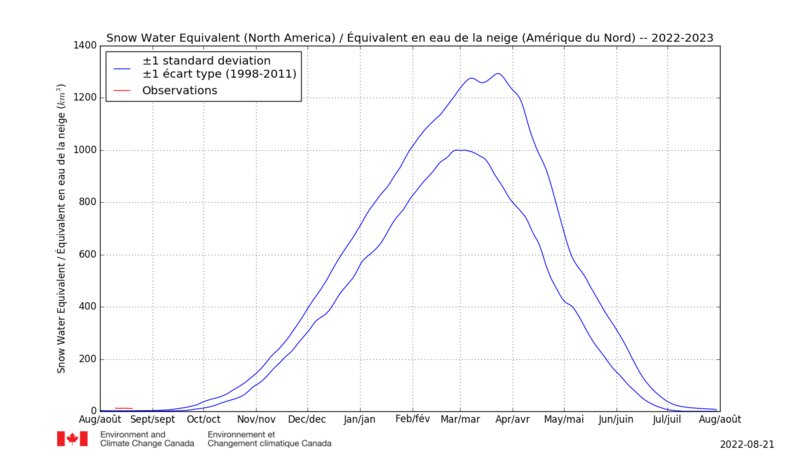 It would appear that most of Quebec has snow cover in excess of 180 days per year. So, where temperatures are cold enough to support snow, we see heavier wetter snows, deep accumulation and positive snow mass anomalies as a result of the higher moisture load in our warming atmosphere. Meanwhile, as the more southern latitudes warm, we do not see similar extent anomalies. The images are striking to say the least. I remember a post from you some time ago how this was a new big project and Xmas was your deadline. Xmas came early. What fascinates me is that you have the data by latitude. Are you producing numeric / graphical analyses of snow-days by latitude (and by region) over time? I ask this as studies say more snow predicted at high latitudes due to increased water in the atmosphere but as temperatures warm presumably snow should melt earlier especially at lower latitudes - the snow-line moving north. My brain just can't get anywhere comparing the yearly maps as a movie, and putting years next to each other can be downright misleading as in the attached image of 2001 and 2017 - 2017 being a very snowy year.